Minor cosmetic changes for Audi's compact sedan and wagon. The is one of Audi's top-selling models. But though it only came out in 2016, the current version is older than the A5, A6, A7, and A8 – all of which have rolled out in their present iterations more recently than the compact sedan. So to bring it up to speed, the German automaker has launched a facelifted version – subtle as the revisions may be. Mildly refreshed for 2019, the Audi sedan and Avant wagon feature new bumpers front and rear, a new array of wheels, and a new sport package. Up front the bumper is redesigned and integrates a chin spoiler. Around back, the diffuser is narrower to accommodate a pair of wider trapezoidal tailpipes to replace the round tips on the outgoing model. And redesigned wheels range from 16 to 19 inches. That's about it for the standard model. But Audi's also offering the S Line Competition equipment package with its own front grille and bumper treatment, LED headlights, and its own set of 19-inch alloys packing red brake calipers and fitted to a sport suspension. The Avant also gets a rear spoiler, and the interior features a sport steering wheel, more heavily bolstered seats, and carbon trim. The package makes the look and feel more like an or R, without the engine upgrade that would go with it. 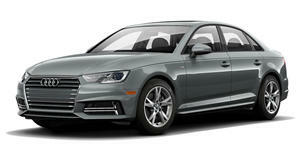 Audi says the revised sedan and Avant will start reaching dealers in the third quarter of this year. No word yet on US availability, but we're sure that will follow in due course – in sedan form, at least. The only wagon version currently offered in the US is the , and that has its own unique appearance. Last year alone, Audi sold nearly 35,000 s in the United States, making it the company's top-selling sedan in America and ranking (to no one's surprise) behind only the more popular Q5 and Q7 crossovers.